Summer calls for Prosecco like Sfriso Prosecco calls for Spicy Scallop Salad! One of the greatest things about making wine is playing around with flavours to find great food-wine combinations. Usually, people who drink wine also love good food. Because today marks the beginning of summer and for us, Prosecco is the wine that best matches with this period of the year, why not match it with something that not only looks, smells, and sounds like summer but also tastes like summer? 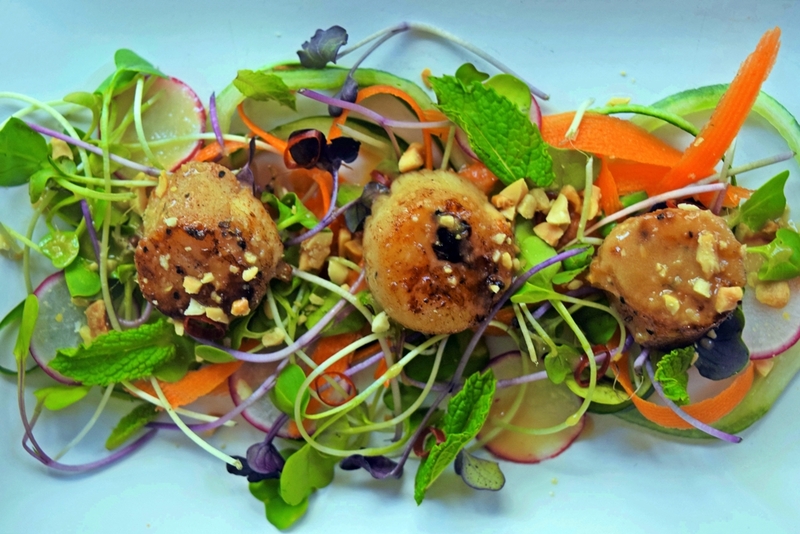 We are talking about Spicy Scallop Salad with crushed Peanuts and Ginger dressing! In a dry small skillet, toast the peanuts over medium-low heat, tossing frequently, until lightly golden and very fragrant, about 5 minutes. Immediately remove the nuts from the pan and transfer to a bowl to stop the cooking process. Prepare the Ginger Dressing and set it aside. Divide the microgreens, chilies, mint leaves, cucumber ribbons, carrot ribbons, and radishes among four plates. Season the scallops on both sides with a pinch each of salt, pepper, and cayenne. In a large skillet, heat the butter and oil over moderately high heat. Once the pan begins to smoke, add the scallops and sear until golden brown—about 1 1/2 to 2 minutes per side. 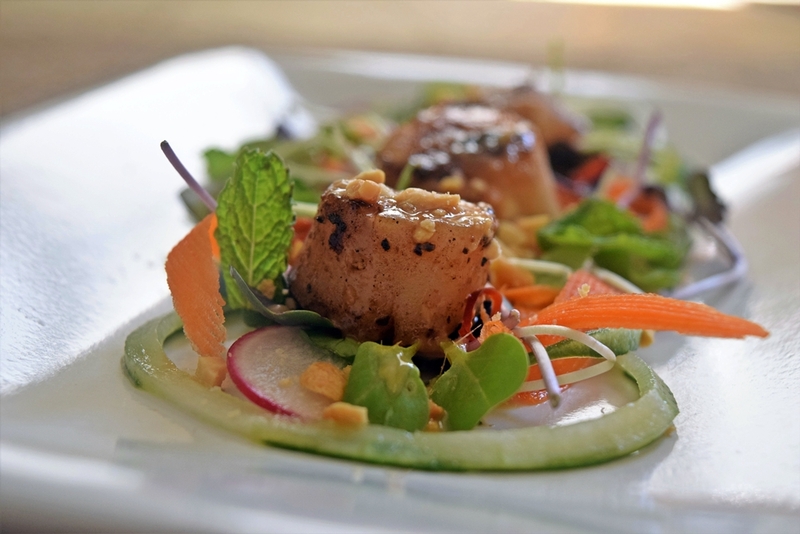 Top each salad with three scallops and a generous drizzle of Ginger Dressing. Garnish each plate with toasted crushed peanuts. In a blender or food processor, pulse the ginger, garlic, sesame oil, mustard, lemon juice, vinegar, honey, and soy sauce until thoroughly combined. With the motor still running, stream in the neutral oil until the dressing is thick and emulsified. Season to taste with salt and pepper. Have we mentioned that this recipe was exclusively developed to match with our Prosecco? Recipe developed by Fanny Slater, winner of the Rachael Ray Great American Cookbook Competition!